1990 Donruss Aqueous Test: What Are the Real Population Numbers? Over the last few months I have been monitoring eBay sales of 1990 Donruss Aqueous Test cards. My original intent was to find an Aqueous Test copy of the Mark McGwire card, but as I spent more time watching these “rare” cards I began to observe some unusually high trading volume. My first thought was that the cards being sold were counterfeit, but because the seller never received negative feedback, my thoughts changed to possible population discrepancies. Before I get into the statistics of my observations, here is a short teaching on this set. Not much is known about the 1990 Donruss Aqueous Test cards. It is hypothesized that the cards were part of a test run that used an experimental water based high gloss coating (aqueous test). 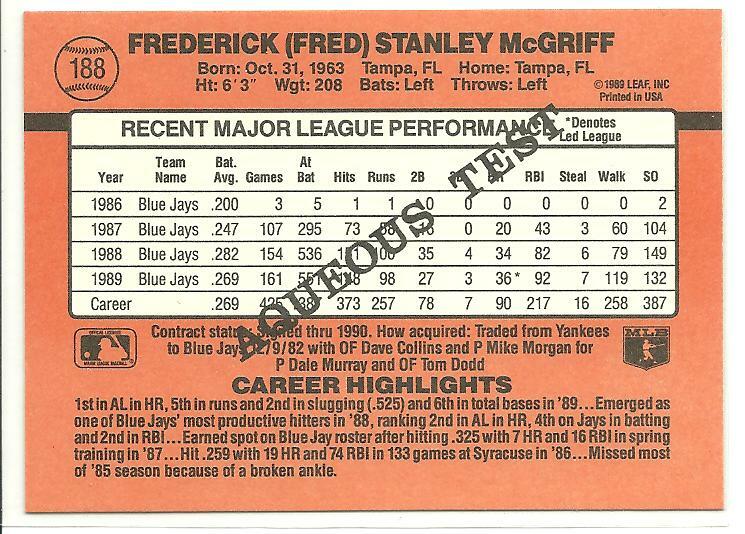 In appearance the Aqueous cards look almost identical to the regular 1990 Donruss set, however they are easily distinguished from their common twins by the words “AQUEOUS TEST” printed (not stamped) diagonally across the back of the cards. Additionally, the Aqueous set consists of 264 cards, which is significantly shorter than the 716 card regular set. Although never officially distributed, there are rumors that the Aqueous cards were packed out in either cello packs or traditional wax packs. Donruss has never released population numbers, but it is generally accepted by most collectors that only 2,000 to 2,500 total cards were produced. If you do the math, you will see that this equals to less than 10 copies of each card. Because of this scarcity, the Aqueous set is very popular with set collectors and player collectors alike. In the ten months prior to July 2012, an average of ten Aqueous Test cards would sell a month. In mid-July, this trend changed. Between July 15th and August 1st approximately 350 Aqueous Test cards were listed on eBay with the majority selling. Included in this surge were two Kirby Puckett copies (considered to be an SP within the already short printed set). Now, it must be noted that the majority of these cards came from one seller, and this is what spurred the initial belief that the cards were fake. But, as the weeks passed and the auctions continued, the seller feedback never recorded a negative. Since August 1st up to present day (October 13) I have seen more than 300 Aqueous Test auctions completed. Currently there are 125 active auctions. So, what does all of this mean? Honestly I don’t know. There are several explanations, but I’m sticking to one. My belief is that the current paradigm that the Aqueous Test cards are limited to less than ten copies is wrong. My argument is based on the sustained influx of auctions with a few caveats. I start my defense with some number crunching. Using the sum of the estimated completed auctions from the last three months, plus the current number of live auctions, it is fair to say that there have been 775 Aqueous Test cards sold in the last 90 days. In comparison the previous three month period recorded approximately 48 completed sales. This is a 1600% increase in sales. If you compare the same number of sold cards to the “perceived” population of 2,500 cards, I am concluding that 30% of the Aqueous Test total population sold in this time frame of three months. Based on this the belief that there are 2,500 total cards is preposterous. My second argument is that the majority of these cards are coming from one seller. I find it difficult to believe that one person has amassed 30% of the total card population. But, in the rare chance that someone has, it blows my mind that this seller would flood the market so carelessly knowing the rarity of the cards. It would make wiser fiscal sense to release the cards slowly and maximize the hype behind the card scarcity. Because of the “uncontrolled” selling, my speculations lead me to a somewhat ominous hypothesis. My theory is that this seller is sitting on a large cache of Aqueous Test cards. This “horde” of Aqueous Test cards is so large that the seller is aware that the population numbers are wrong. So, rather than grind the cards out over the next two years, this individual decided to catch the market by surprise and list as many as possible. This is a risky move, but can payoff big when you look at how slowly it takes the market to react to the incursion. Most collectors are more concerned about purchasing the cards they need then paying attention to how many other cards are for sale. Only a small group would notice the volume, however how many of these collectors would have the discipline to track them for more than the life of the auctions? available than originally believed. Personally, I think the population numbers are about double of what the hobby thinks; between 4000 and 5000 total cards or less than 20 copies of each player. Regardless this is a rare set and should be a challenge for any set or player collector. If you have any questions or comments, feel free to email me. Note: This article was written in 2012. Here is an example of an Aqueous Test card back.